There are increasingly more arguments in favor of having more shorter, better quality games over sprawling, padded, big-budget games. There seems to be a persistent mindset that assumes the length of the game justifies the price, therefore it follows that a short game may be overpriced. Thus game developers see the incentive of padding their games to make their games artificially longer to justify their price tag. I believe these days gamers are beginning to see through their tricks, and I found myself avoiding games like Dragon Age and Skyrim because of their purported lengths. The question that follows from this: Is worth it to spend your money on a shorter game, but getting a good experience overall? How much is a good game worth? Should you wait for the price to drop first? Of course different individuals will have different answers. We can actually see what people on the whole think — by looking at Steam scores and the price! 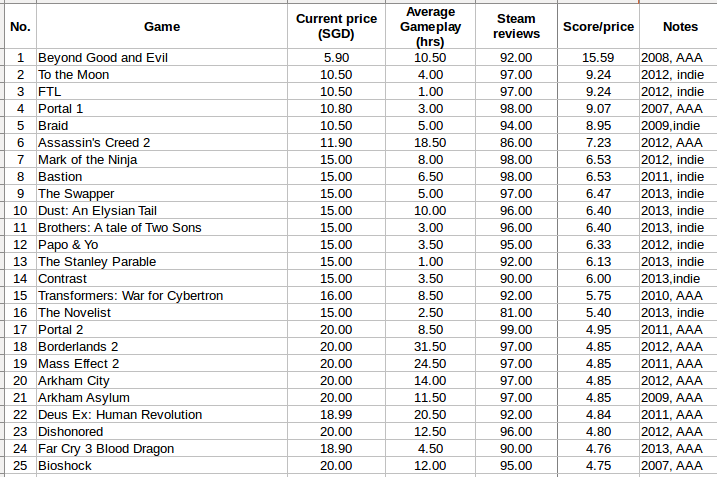 By re-purposing my spreadsheet I used for an earlier post, I made a list of 46 games along with their percentages of Steam recommendations and the current prices (understandably, older games will be cheaper). Also I looked up the average length for each game using howlongtobeat.com. Next, let us agree to ignore game length and try to find the best game in terms of value-for-money. Of course, what makes a game “good” is highly subjective but for the sake of discussion let us use the Steam recommendation percentages. In essence, which game that is the cheapest, yet has the highest Steam recommendation? 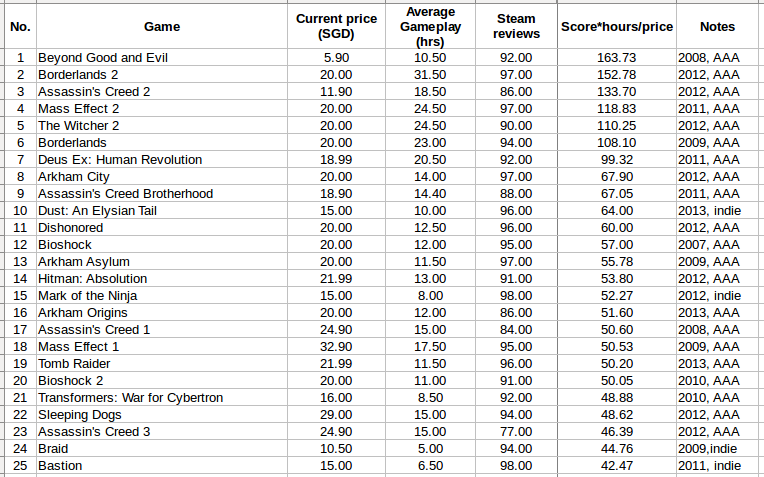 As we can see, 7 out of the top 10 score/price ratio games are lower priced indie games. The other three are older games from Ubisoft and Valve. The last place goes to Assassin’s Creed Unity, which is perhaps unsurprising, especially with it’s full, recently-launched price combined with the infamous glitches and negative reviews. Now the shorter indie games have dropped lower in the list. Beyond Good and Evil is still no. 1, perhaps due to its price. The other top 9 games are the big RPGs like Borderlands and The Witcher 2. The top indie game is Dust: An Elysian Tail giving 10 hours of gameplay. My choice of 46 games is somewhat arbitrary. I started with about 30 randomly chosen games from my own Steam library and added more games. It would be better to, say, rank all games within the same year. The different games are released at different times. So obviously older games with reasonably good reviews would occupy higher places. 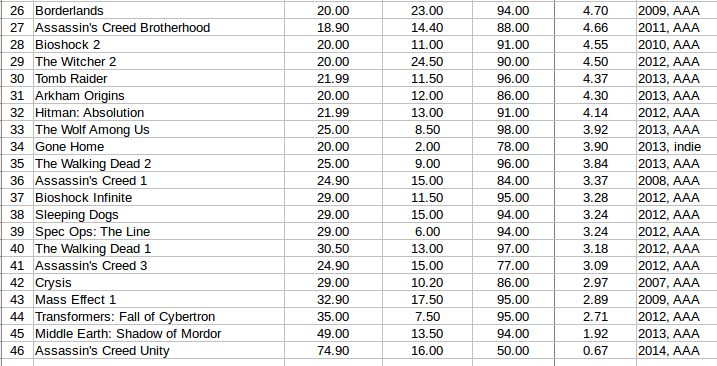 I’d imagine games like Middle Earth: Shadow of Mordor would be much higher in 5 years time. 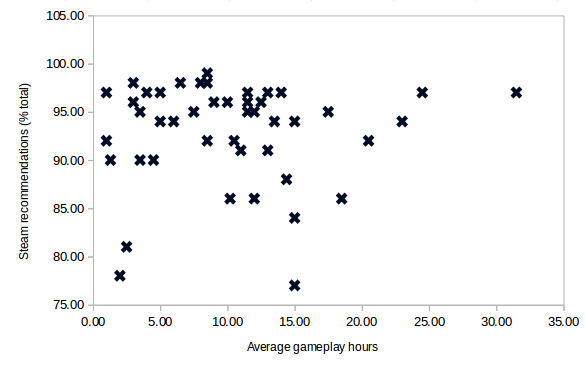 See the problem of game length vs quality depends on the demographic category of the gamer. Some players are adults having a full-time job, perhaps with families or other stuff going on with their lives. For these people there is a very narrow window of (let’s say) 2 hours or less per day for gaming. Also, adults, being older might have read more books and watched more movies accumulated over their lifetimes. So they might appreciate some nuanced aspects of games such as writing, voice acting or some creative design ideas. Thus we could imagine these gamers would probably choose Gone Home over Skyrim. However what if the gamer is a high school or university student having three months of school holidays? These gamers might be in a much better position to appreciate the coolness of badass dragons in Skyrim and would dismiss Gone Home.